WASHINGTON, DC, October 25, 2018 (ENS) – A second round of tests commissioned by the Environmental Working Group, EWG, has found glyphosate, the active ingredient in Monsanto’s Roundup weed killer, in every sample of popular oat-based cereal and other oat-based foods marketed to children. Glyphosate is an herbicide linked to cancer by the World Health Organization’s International Agency for Research on Cancer, IARC, and also by California state scientists. The U.S. Environmental Protection Agency’s legal limit for glyphosate on oats, 30 parts per million, was set in 2008, well before the cancer findings of the IARC and California state scientists. The results of EWG’s second round of tests, released today, showed glyphosate in all 28 samples of products made with conventionally grown oats. All but two of the 28 samples had levels of glyphosate above EWG’s health benchmark of 160 parts per billion, ppb. The results of EWG’s first round of tests, published in August, also found glyphosate, the most heavily used pesticide in the United States, in three-fourths of the samples at levels that are dangerous to human health, according to the nonprofit group based in Washington, DC. About one-third of 16 samples made with organically grown oats also contained glyphosate, all at levels well below EWG’s health benchmark. EWG scientists purchased products in grocery stores in the San Francisco Bay area and Washington, DC, area. About 300 grams of each product were packaged and shipped for testing to Anresco Laboratories in San Francisco. In the second round, Anresco conducted tests on 10 samples of different types of General Mills’ Cheerios and 18 samples of different Quaker brand products from PepsiCo, including instant oatmeal, breakfast cereal and snack bars. 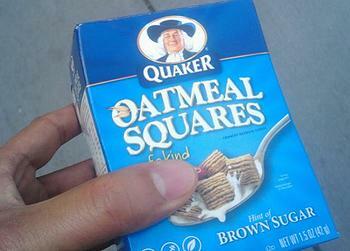 The highest level of glyphosate found by the lab was 2,837 parts per billion in Quaker Oatmeal Squares breakfast cereal, nearly 18 times higher than EWG’s children’s health benchmark. These test results contradict claims by two companies that make the cereal products, Quaker and General Mills, which have said there is no reason for concern. They claim this is because their products meet the legal standards. But just because something is legal doesn’t mean it’s safe, says EWG. “Federal government standards for pesticides in food are often outdated, not based on the best and most current science. The EPA’s standards for pesticides and other chemicals are also heavily influenced by lobbying from industry,” the group said. Almost all of the samples tested by EWG had residues of glyphosate at levels higher than what EWG scientists consider protective of children’s health with an adequate margin of safety. The EWG’s findings of glyphosate in many popular breakfast foods, come immediately after a major study published in “JAMA Internal Medicine,” a peer-reviewed medical journal published monthly by the American Medical Association that found a significant reduction in cancer risk for individuals who ate a lot of organic food. “How many bowls of cereal and oatmeal have American kids eaten that came with a dose of weed killer? That’s a question only General Mills, PepsiCo and other food companies can answer,” said EWG President Ken Cook. Following release of the first batch of tests, General Mills and the Quaker Oats Company went on the defensive, noting that glyphosate levels found in their foods were within regulatory limits set by the Environmental Protection Agency. 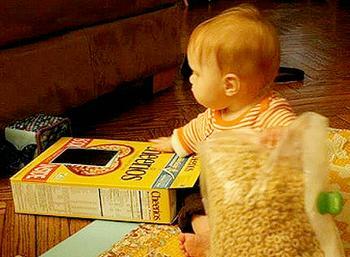 EWG does not believe chemicals linked to cancer belong in children’s food. Our recommended maximum daily intake of glyphosate in food is 0.01 milligrams. For a 60-gram portion of food, this daily intake limit translates to a safety standard of 160 ppb of glyphosate. This health benchmark is based on the risks of lifetime exposure, because small, repeated exposures can add up if someone eats food containing glyphosate every day. After sitting on data from its own glyphosate tests for more than a year, the Food and Drug Administration finally made the results public last month. The FDA found glyphosate on about two-thirds of corn and soybean samples. But it did not test any oats or wheat, the two main crops on which glyphosate is used as a pre-harvest drying agent. More than 156,000 people have signed a petition from EWG and Just Label It calling on General Mills, Quaker and Kellogg’s to get glyphosate out of their products. Last month EWG – joined by companies including MegaFood, Ben & Jerry’s, Stonyfield Farm, MOM’s Organic Market, Nature’s Path, One Degree Organic Foods, Happy Family Organics, Patagonia, PCC Community Markets and Amy’s Kitchen – petitioned the EPA to sharply limit glyphosate residues allowed on oats and prohibit its use as a pre-harvest drying agent. EWG sent letters today to General Mills and PepsiCo asking each company if it had conducted similar analyses for the presence of glyphosate. If any tests have been done, EWG asked the companies to inform the public when the testing began and what they found. The Quaker Oats Company, known as Quaker, is an American food conglomerate based in Chicago. It has been owned by PepsiCo since 2001. In an EPA risk assessment, the agency found that one to two-year-old children are likely to have the highest exposure levels.